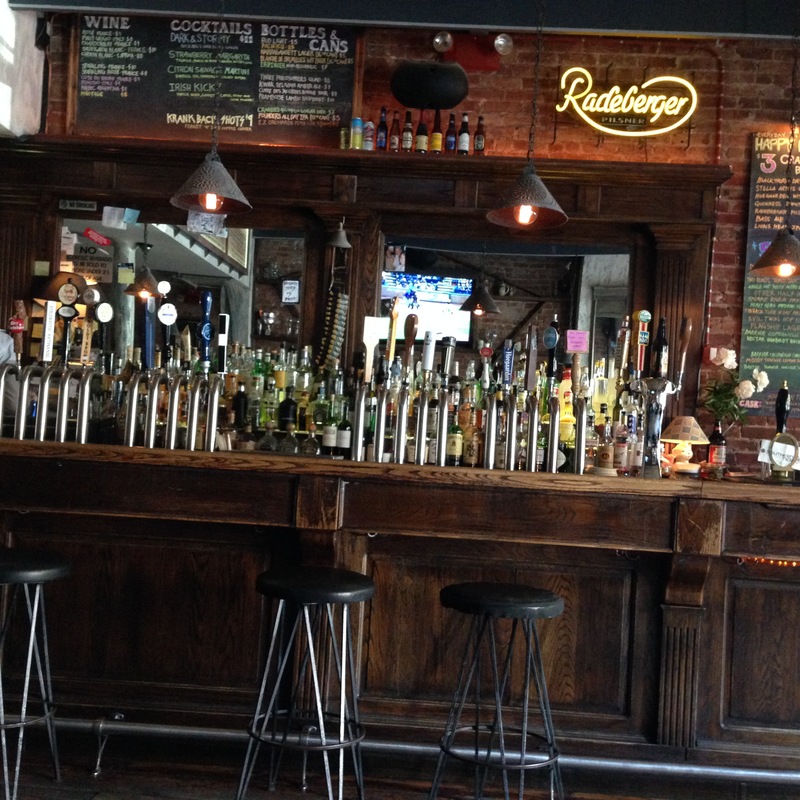 This Gal decided to take a Sunday inSpring and enjoy a NYC Village Pub Crawl. With list in hand my companion and I made our way via bus and subway to the Village. First stop was to be Jimmy’s No.43 but just a couple of doors prior we came to McSorley’s Old Ale House. This wasn’t on the list since my goal was to hit places I’ve never been to but then again it’s McSorley’s so a stop was required. It’s been years since I last visited and nothing has changed, same saw dust on the floors, same cobwebs and dust hanging from the lamps. The only change seemed to be my furry four legged cat friend was no longer around. Same beer is available as well. 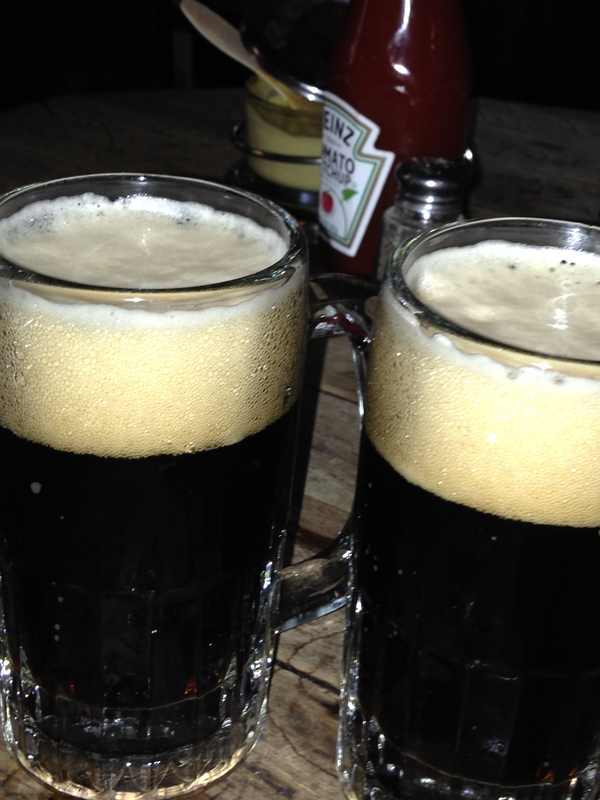 McSorley’s serves two types of beer light and dark. Yup, it’s that simple so, of course, I ordered a round of dark. A round still consist of 2 small mugs of beer for only $5.50. The dark is a smooth tasty dark lager and makes for easy drinking. 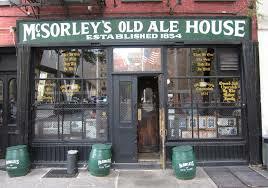 McSorley’s is an institution with a great atmosphere which is why one visits this historic place. After my round of dark it was time to visit the first stop on my list Jimmy’s No. 43. 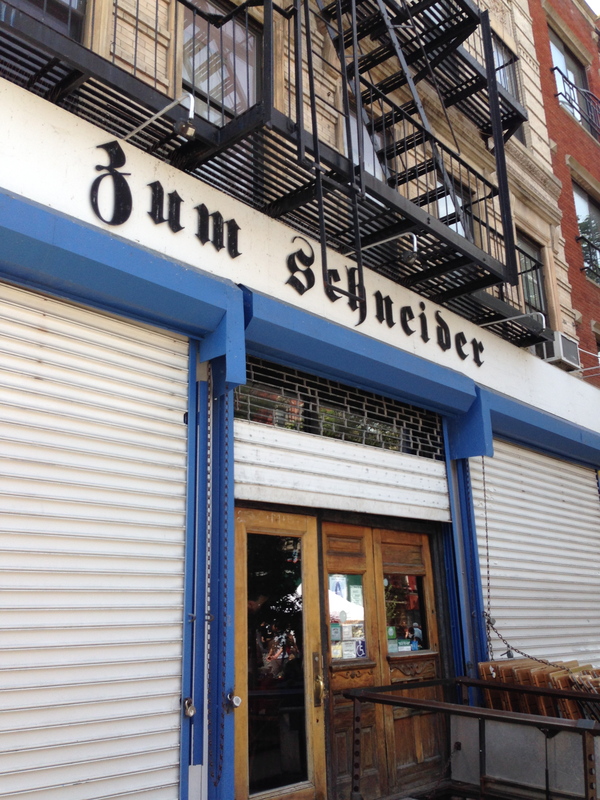 However, a bit more planning should have been involved since Jimmy’s didn’t open until 4:30pm and it was only 1:30pm. Strike #1 Sigh…so next up was Good Beer. We had hope things would improve and they did. Several more blocks and we arrived at the #1 spot on my list to try. Alphabet City Beer Co. (ABC Beer Co.) I’ve heard a lot good things about this place and I was hoping it would live up to it’s reputation. 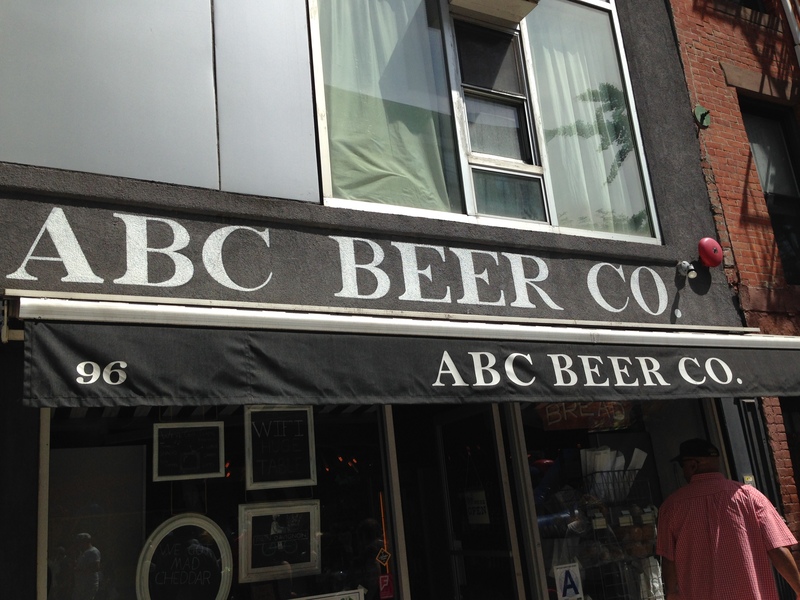 ABC is a craft beer store and bar with a cool laid back atmosphere. The bar itself is small and only sits a handful of folks but there’s a large communal table in the back for hanging with friends plus a few comfy high back chairs that just beg for someone kick back with a book and beer. A limited food menu is offered and it appears all the food is made behind the bar. My friend and I decided to grab two seats at the bar and I went to work studying the tap list. There are 12 taps that rotate often so you never know what you may find. The one draw back about the tap list, well, I found it hard to read. At first glance you might thing there were only 6 beers on tap but look closely and you’ll see all 12. Taster rounds aren’t available but the bar tenders are fine with pouring small sample tastes. 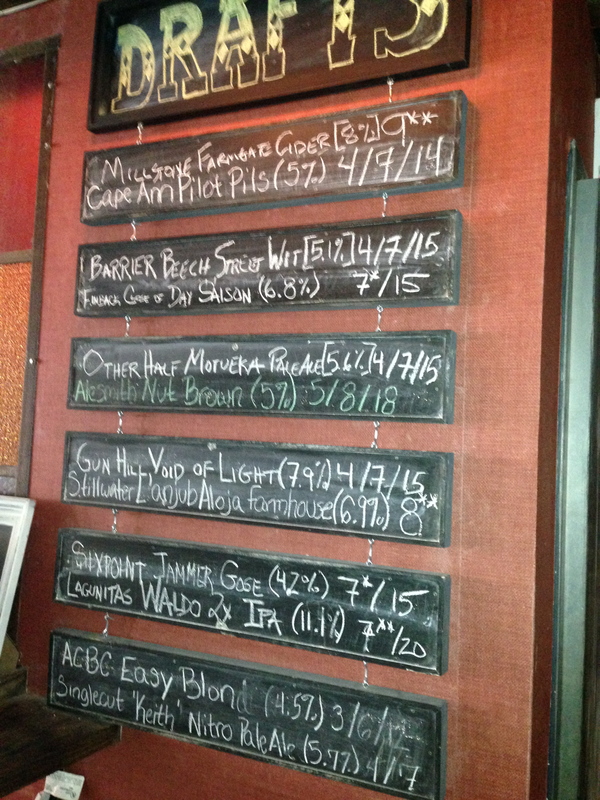 I found it helpful that the tap list shows the pricing for half pours, pints and growler fills. 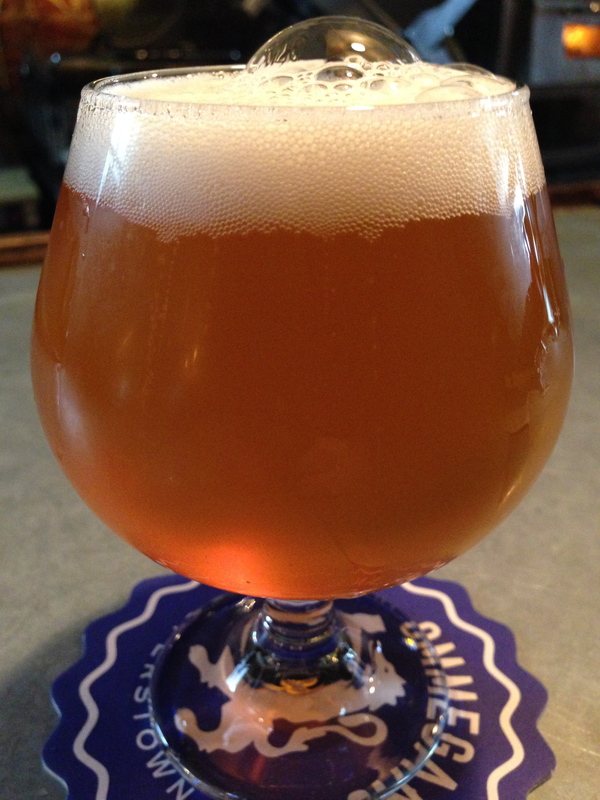 Barrier Beech Street Wit 5.1% – I was so happy to have this beer placed in front me. I was hot and this beer was crisp and refreshing with wonderful wit hints of orange and coriander and just slight undertones of banana. This Gal always gets excited to see a brown ale on tap and wished I would see them more often. This is a well done medium body English brown that’s creamy and offers just the right balance of nuts, malts and whole bread goodness. I love Farmhouse ales! Love, love, love! This has the classic cloudy yeasty body associated with this style. Crisp, sour, yeast, fruit, pepper and a hint of saison funk all add up make this an enjoyable Farmhouse ale. We decided to just walk around and see what restaurant caught our eye on the way back to the subway when I spotted a little gem called the Drop Off Service. This looked like my kind of bar! 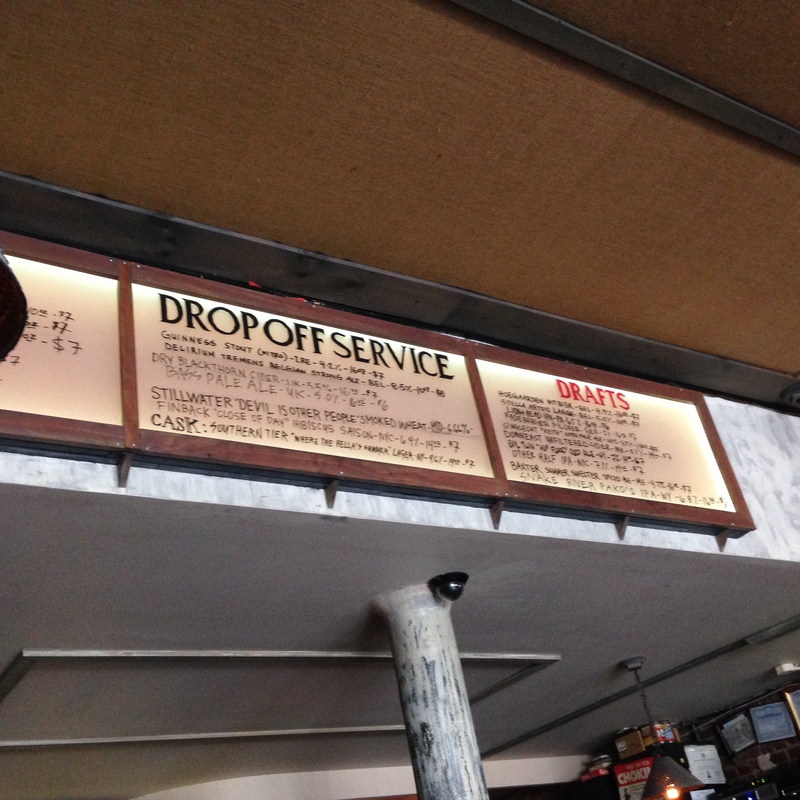 The Drop Off Service is an bar located in an old laundromat building. Now this was EXACTLY what this Gal was looking for – a cool off the grid beer bar with a grungy, laid back, old work feel to the place with lots of bring, wood and iron. Besides a killer tap list they also offer wine and cocktails but no food. However, one can bring in food from the outside. 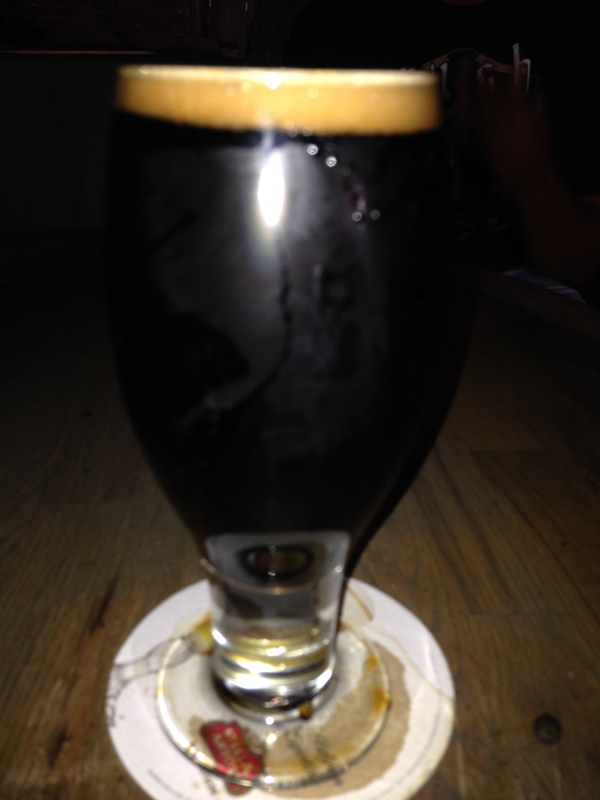 Now that I had time to relax, cool off and enjoy some beer at ABC Beer Co. it was now time for a stout. YES! I don’t care that is was freaking hot out I still love me a stout and this stout had everything I was looking for. Roasted malts, chicory, chocolate and bourbon undertones. I wasn’t sure just how strong the lemon would be and hoped it wouldn’t overpower the other flavors. The lemon was pretty strong but the coriander was still there. Still it was a bit too lemony for this Gal. 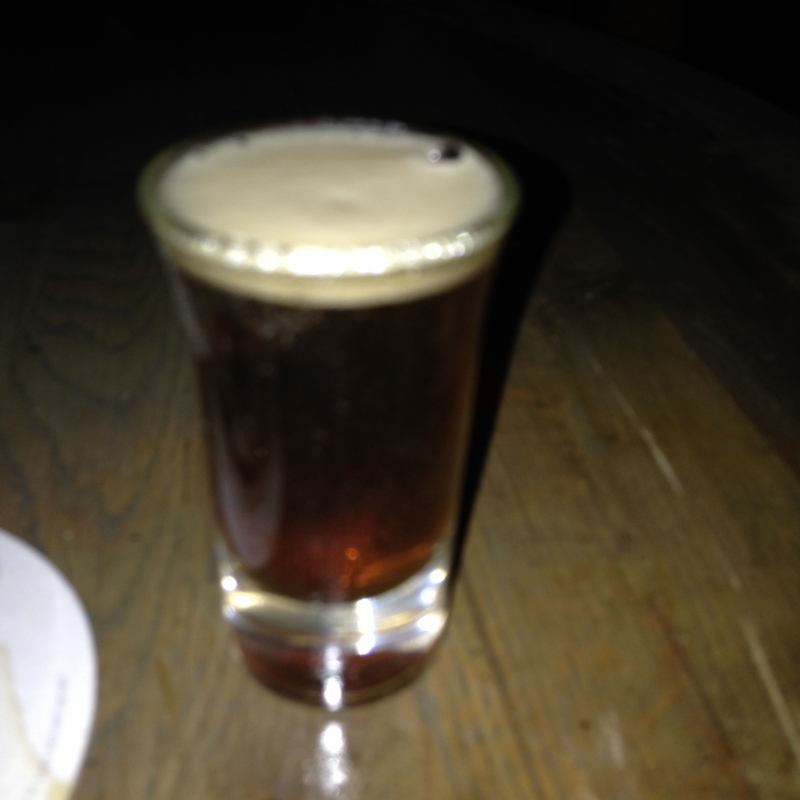 Humboldt Brown Hemp Ale, Humboldt Brewing, CA 5.7% – Two brown ales in one day? I must be in OZ. This is a very mild creamy brown with earthy flavor accented by roasted nuts and malt. Good but not great still worth trying. 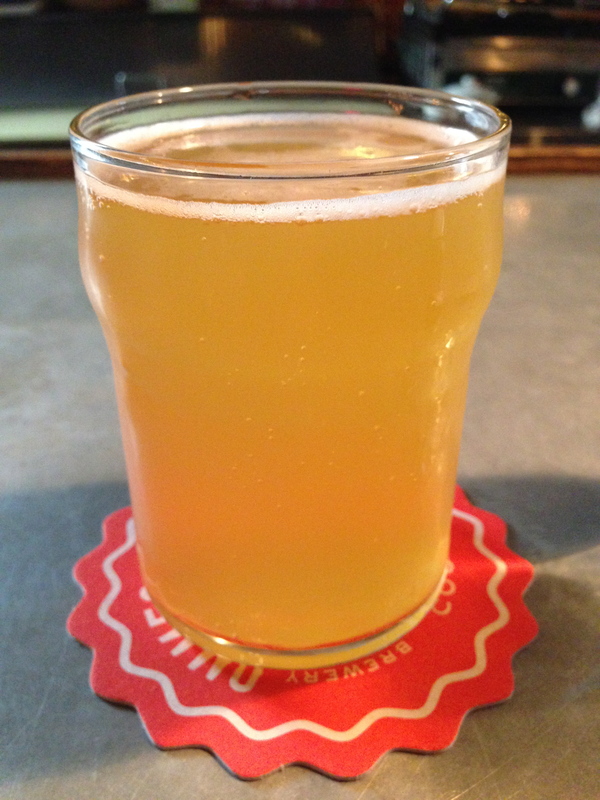 The Drop Off Service offers Happy Hour everyday with $5 craft beers until 8pm. Why is craft beer cheaper in NYC than Central NJ?! The Drop Off Service was the favorite stop of the day! Now it really was time for us to move on in search of some food…until next time NYC.